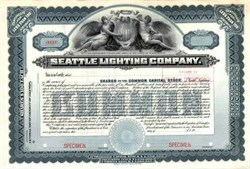 Beautifully engraved RARE SPECIMEN certificate from the Seattle Lighting Company. This historic document was printed by the American Banknote Company around 1920 and has an ornate border around it with a vignette of a shield between two allegorical women. Seattle Lighting Company established the Old Seattle Gas Plant on Lake Union shore which still stands as a symbol of Seattle history. It's now part of Gas Works Park, a 20.5 acre park. From 1906 until 1956, the Seattle Lighting Company occupied the site on Lake Union. In 1963, the City of Seattle started buying the property with intentions of building a park for the city, and in 1968 the development of an urban park on the site was approved.